Welcome to Holiday RV By using this website, you accept the terms of this Policy. This is a legally binding agreement between you and Holiday RV please review it carefully. Photo(s) are supplied for the conveinence of the user and may not represent actual vehicle. Variations in color, trim, and other features may exist. The information, such as prices and mileage, presented on each vehicle is believed to be reliable and we make every effort to provide the latest and most accurate information. However, we cannot guarantee that this information is accurate, complete or current. We are not responsible for errors or omissions and do not warrant the accuracy of this information. Please contact us directly for vehicle availability and option content. The Website is an evolving medium. Holiday RV may change the terms contained herein without notice. It is the user’s responsibility to be familiar with the terms in this agreement. By using this website, you agree to be bound by this agreement in the current posted form. The material that appears on Holiday RV is for informational purposes only. We make every possible effort to ensure the accuracy of all information displayed, but errors may appear. If you elect to purchase a vehicle, or any goods or services described on Holiday RVWebsite it is your responsibility to confirm the accuracy of the information (including the price). We cannot provide any guarantees or warranties of the information that appears on Holiday RV and are not responsible for any such vehicles, goods or services. The prices listed by sellers on Holiday RV often exclude sales tax, finance charges, title, license, regulatory, dealer documentary, fees, any or all of which may be added to the listed price to arrive at the final sale price of a particular vehicle. Other fees, exclusions, and conditions may apply that are not explicitly stated on Holiday RV Website. Whenever you visit our web site www.holidayrvusa.com, you automatically accept the terms and conditions that we have stated to access and use our website. All Content on our website, including the inventory database, is the sole property of Holiday RV and is protected by U.S. copyright and international treaties. You may not reproduce, modify, display, sell, or distribute the content, or use it in any other way for public or commercial purpose. This includes copying or adapting the HTML code used to generate web pages on our website. Holiday RV makes no guarantees and assumes no responsibility for the content or conduct of its users, nor for the content and operation of our website. Use of our website, reliance upon its content, and interaction with its users is at your own risk. 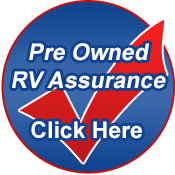 Holiday RV does not guarantee that inventory displayed on the site will be in stock at the time of viewing.